With my graduation date looming ahead this Fall, I can’t say that I felt too good about the future of my career when reading about the layoff of 28 photojournalists by the Chicago-Sun times. 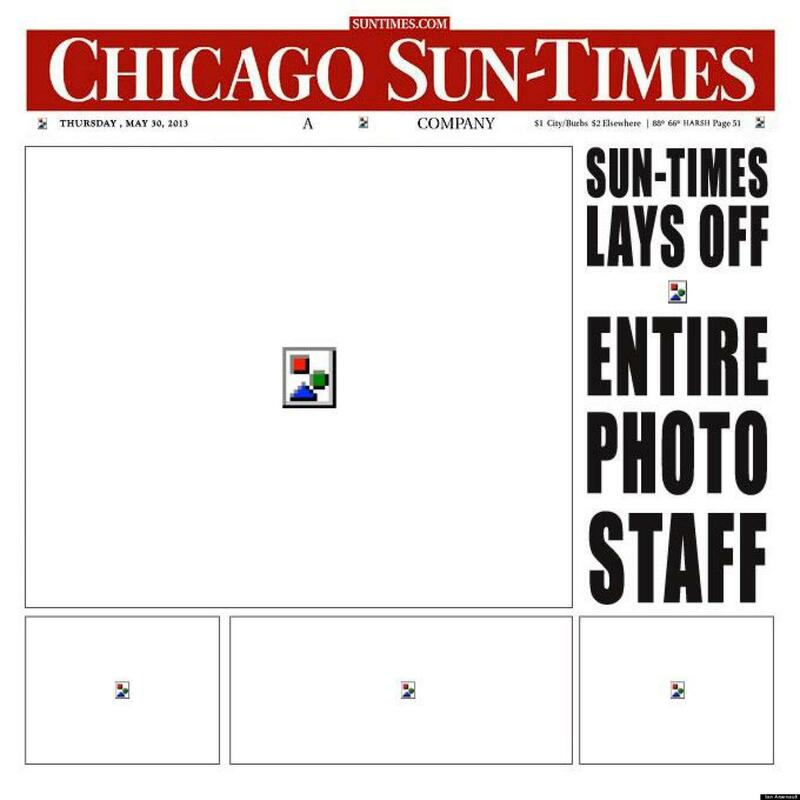 Basically, the Sun-Times have found ways to get their visual content without having to pay a price for it. On one lovely morning, they abruptly fired 28 of their photography staff, including Pulitzer Prize winners. Reader submitted photos are now the main source of visual journalism. They are also arming their reporters with iPhones and training them in “iPhone photography basics” so they can take photos while reporting, putting them on double duty without double pay. I have known many many great reporters who still cut the heads and feet off of people because, let’s face it, not everyone can take a GOOD, TELLING photo. I am still learning how to tell a story in the best way possible through photography and every time I think I finally have it, there’s always something that I could have done better. Another point is the photojournalism is a story told with light. Light changes the mood and emotion of any situation. Depending upon how something is lit, it can change the entire feel of a photo. Now, how does the iPhone do with all that light manipulation? Oh, what’s that? Right, you can’t do a damn thing with light and an iPhone. I just think that our news audience isn’t as stupid as they are targeted to be. They will realize that the photo quality isn’t top notch. People are visual and the first thing they look for when searching for the news online are photos and video. What’s the point of having photo and video if they aren’t telling or done in a way that a trained professional knows how to tell a story visually? As a college student about to graduate with a degree in journalism and new media, I can’t even begin to state how disheartening this news is. At my university we are trained in “new media” which just means reporting, writing, blogging, video blogging, video, audio, basically everything. Coming out with a degree in journalism nowadays means that you are a jack of all journalism trades with a focus on one or two points. This layoff makes me sad and angry that talented, hard working photojournalists are given the boot of greed and money in exchange for cheap iPhone photos. They think you can’t differentiate between a powerful photo and a quick snapshot. This decision’s success banks on the ignorance of the public reader aka YOU. What’s next? Is Siri going to start writing articles too? Technology, although at times a blessing can be a curse. People are getting lazy and along with that comes sub standard products, in this case newsworthy photos, that was a well thought out process now just a click of a camera phone. Where has the pride gone? As a society we have accepted this and now it is turning into a monster of a sub-standard product. Another very sad day…. There is simply no respect for the craft of photography anymore. It’s apparent with film, has been for awhile, and now it’s even moved onto the digital world; the resolution and quality of an image becoming trumped by convenience and cutting corners. So sad. There’s so much more to photojournalism then a click and be there photo. It’s even more sad the fact that the newspapers are doubting the intelligence and eye of their readers.